Get cash for your car in Illinois today! Sell your vehicle today and get immediate payment when we pick up your car. We purchase cars in every city in Illinois, sell your car in Illinois now. Easy – Only takes 3 easy steps to get cash for cars in Illinois. Top Price – Due to our extensive network of buyers/auctions throughout the United States, National Cash 4 Cars is able to offer you the highest price for your car in Illinois. Free Pick-up – Our drivers are able to come to all cities in Illinois to pick up your vehicle, and give you your money on the spot. All Cities Served – We serve every single city and market in Illinois. Cash for Cars in IL today! Courteous – National Cash 4 Cars works with its customers in Illinois to ensure the smoothest selling experience, and strongly values the lifetime partnership with our Illinois customers. Stress Free – National Cash 4 Cars buys any make or model, running or not. We buy used vehicles in all types of conditions. Get top dollar in Illinois today! Expertise – Over 50 years of automotive experience, we are standing by to purchase your car in Illinois today! Selling a car using a cash for cars in Illinois company are something a lot of residents in the state are considering. The process is fast and is generally much easier than trying to sell your vehicle yourself. Cash for cars companies like National Cash 4 Cars will purchase your vehicle site unseen. You basically fill out a quick application on their site, and you will typically have an offer within an hour (typically in 15 minutes or less. Once you accept the offer, the next step is to have the tow truck pick up your vehicle (free of charge), and you get your check at that time. To do this, you either call them up or fill out the form on their website, and they will have all the information they need. In other words, it is a much faster way to sell your vehicle than trying to do it yourself. Cash for cars companies are noted for only taking damaged vehicles. However, some companies will purchase any kind of vehicle regardless of the condition it is in. There is typicall no vehicle they will turn down (except those with major liens), as they take total loss, uninsured, salvaged, and even storm and flood vehicles. Most companies will pay you cash on the spot when they come to pick up the vehicle. Many firms will not charge you for picking up the vehicle, even if it has to be towed. Generally speaking, the total transaction time will generally be 1-2 days or less. If you sell the car before 11am you can often times have the vehicle taken away before 6pm on that same day. Of course, it really depends on where you live. If you are far from Chicago, Springfield or any other large Chicago city, they might still come the next day. To finish the transaction, you must simply fax them a copy of the title and drivers license. If you do not own the vehicle yourself, you will also need a power of attorney and a copy of the owner’s driver’s license. 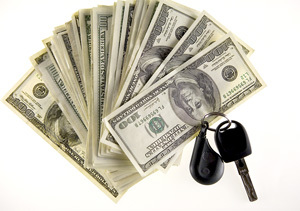 Using a cash for cars in Illinois company can definitely speed up the process of selling your vehicle. You will generally get a good price for the car or truck simply because of the large network of buyers that view it. These are sources you would not have access to by simply listing the vehicle on Craigslist or another website. You might be able to get a bit more if you sell it yourself, but it will also require a lot more time and effort.